Happy Valentine’s Day! *Free bridal bouquet and matching boutonniere for Valentines Day weddings! 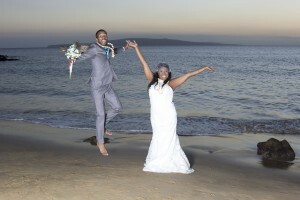 It has been Valentine’s Day every day at Merry Maui Weddings. We are so blessed. We are privileged to speak to and help plan the weddings of so many sweet couples and families. We are excited to start another Valentine’s Day-year of co-creating more wonderful weddings with lovely people coming to Maui to make their dreams come true. It is not too late to plan a Valentines Day wedding. Here at Merry Maui Weddings, we are available to help you. *Bouquets and matching boutonnieres are limited to tropical flowers in season. This special applies to all weddings booked from now until March 1, 2019. Romantic photography by Cathy Simone. Validation: Sum of 2 + 7 ?